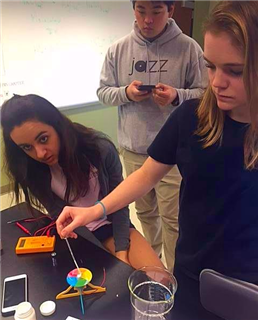 Drawing on their knowledge of voltage, current, resistance, and electromagnetic theory, students will design, test, and adjust their cells to create the maximum amount of energy. The goal is .35 volts - enough to power a small, digital clock. Solar cell creation is the third design project Nanotechnology students have engaged in on the topic of alternative energy. Dr. McCabe hopes to incorporate a final project that will allow students to explore how advancements in drug delivery methods are affecting medical technology.